On July 1st 2011 there will be a partial eclipse of the Sun. The eclipse is the start of a New Saros Series, 13 South and as such this brings with it a whole new dynamic that will unfold over the next 1300 years or so. We will understand more about this as the year progress. The Eclipse has a strong aspect involving Leaders as the New Moon is square Saturn and opposing Pluto. A T-square is formed, so expect tension to rise in areas associated with decision making! The Australian Senate will change on July 1st 2011 @ Midnight??? Some interesting stat’s on the Independent’s that are likely to share the power in the new makeup of the Australian House of Representatives and the significants of the looming Lunation Cycles. ....And the Node about to regress to 8 degrees Cancer/Capricorn!!!! 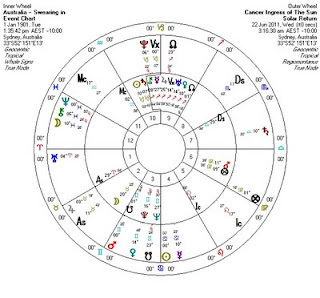 Bob Katter born 22 May 1945 Cloncurry Qld...has natal Saturn 8 degrees Cancer same as Bob Brown and this is the degree of the 1901 Federation’s chart 2010 Solar return Moon (7 degrees Cancer)...which fell in opposition to Federation’s natal Saturn and which has been the driving force behind all the government woe’s this year....Moon is the Public mood or sentiment...so Moon/Saturn is not a favourable feel..!! So Bob Brown, who is a Senator, but will play a role here...Bob Katter, Tony Windsor and Rob Oakeshott all have 8 degree Cardinal Saturn’s in dynamic formation to the Federations Natal Saturn which is 8 degrees Capricorn. Hey this is going to be some show down!!! I as yet have no details on Adam Bandt. Finally in this brief synopsis the coming year with Transiting Saturn to fall on 8 degrees Libra as Venus goes retrograde on October 8 2010. Venus will regress to 27 Libra the same degree as Abbott’s and Gillard’s natal Mars!!! Wooooeeee!!!! Will update and post more when I digest this lot!!! 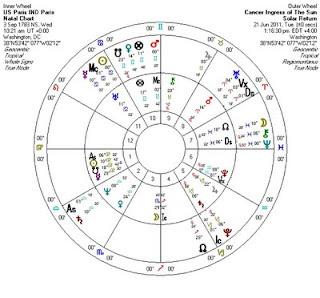 Ok so the eclipse of July1 is at 9 Cancer opposing the natal Sun in the 1901 federation chart. Today June 21/22, 2011, marks the Solstice, a Time when the Sun reaches its furthest declination north and pauses, stationary, or appears to stands still for a moment before appearing to move backwards towards the centre, Equator. 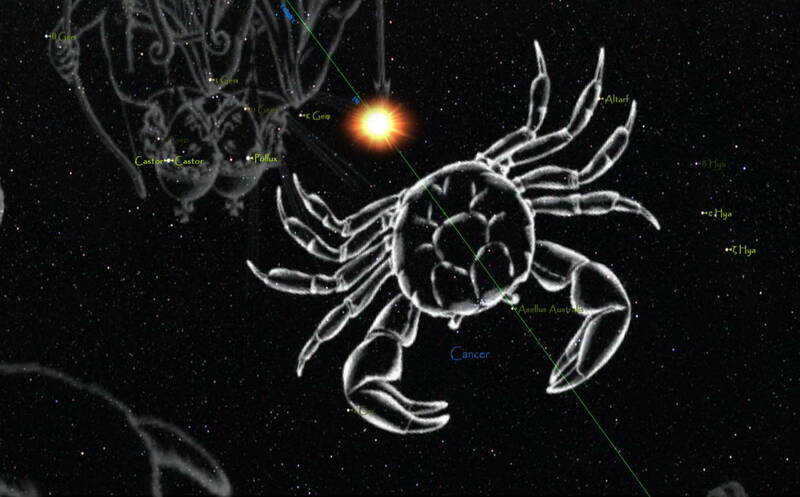 The Sun’s entree into the image of the Crab marks a unique point in Time, and as such the chart cast for this moment is said to be the Ingress of the Sun. This chart can be cast for any location in the Globe to consider the coming quarter months. To gain the most from these Ingress charts it beneficial to view them in-conjunction with the national chart of the nation you wish to assess. 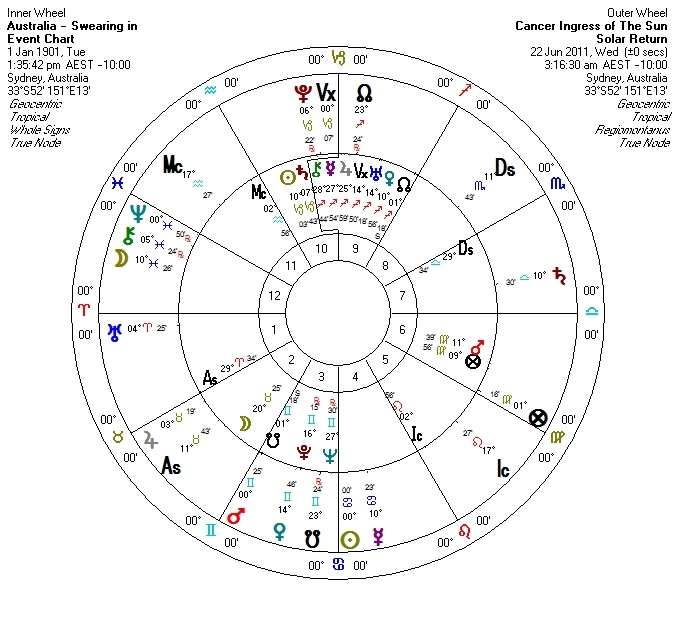 Here in Oz I’m combining the Cancer ingress and national chart, 1901 Federation, the first noticeable aspect is the direct opposition from ingress Mercury projected to the natal Sun. This aspect falls in the 4th /10th houses, which are a representation of; the 4th opposition and 10th government. The Sun is the leader, so expect to see a Contestation, or I should say a continuation of extreme challenges from the opposition toward the Leader and the Government, in particular involving matters of the 4th house, which include geology, mines, building, crops and the weather, also the 4th is the domain of earthquakes. The Sun rules the 5th house, the Senate as well as children. These matters will also experience this aspect, Contestation. 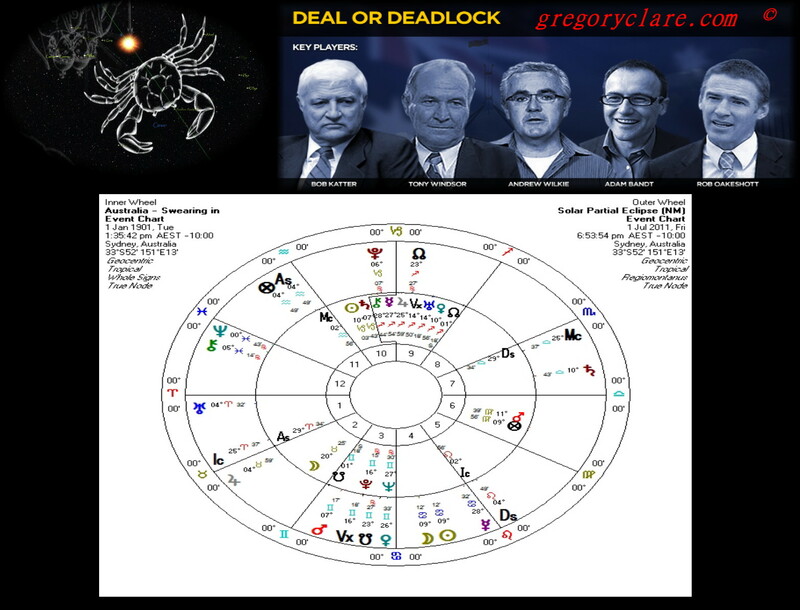 Mercury rules the 6th and the 3rd houses, which are the Military and Labor party, these too will come under the spotlight in coming weeks and months. 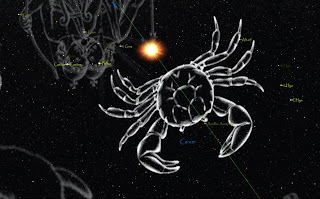 Other aspects included in this Cancer ingress; is a direct opposition between ingress Venus and natal Uranus. This aspect involves the 9th and 3rd houses, inland transport, communications and neighbouring nations, and the 9th is Law, overseas transport, religion, foreign affairs and immigration. These areas of expression or features will also receive more prominence from July 2011, as another Solar eclipse will accrue on July 1st. This eclipse will be felt across the nation; don’t be surprised to see the ground shake! Moving aboard to the US, the ingress chart set for Washington DC, and combined with the 1783 Paris treaty chart brings with it Money challenges involving the stock market, overseas earning and homeland investment. These matters will be high on the agenda during the coming weeks and months. 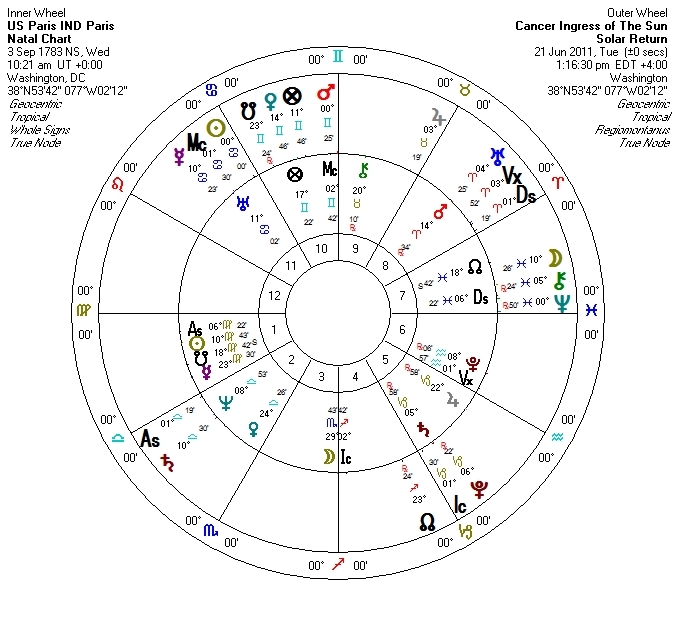 There is also a volatile aspect involving the MC of the national chart, Mars is co-joined to the Mid-Heaven of the Paris Treaty chart and is in a tight square aspect with Neptune. Stay tuned as I get more Time, I will endeavour to update this report! In the mean Time stay safe.